Ss Hotel Hyderabad biryani is a fantastic and decent hotel near your location because they will give you more taste and preferences. Ss hotel price is moderately better than another restaurant. Yes, today I'm ordering biryani in hotel ss biryani by swiggy, Then my order has arrived within 20mins super fast and I picked up my food and ready to review that food with much excitement. i opened that food and ate it too much because of the decent packing and delicious taste and the biriyani quantity is good well packing with more extra side Dish. The biriyani price is just 206Rs it I'll be very worth for the taste. 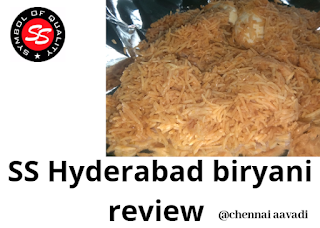 The ss Hyderabad biriyani hotel will give more preferences to their costumer. One main thing in that hotel means panner butter masala is very famous in this restaurant because the taste of panner is soo delicious. 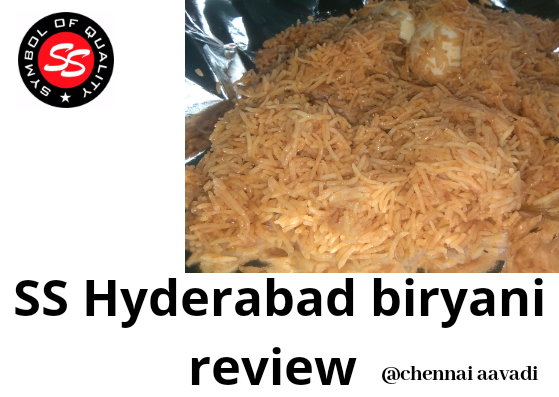 If you are in Chennai you must kindly visit hotel ss Hyderabad biryani. Kindly share this post with your friend and suggested this hotel.